Welcome to the Ministry of Peculiar Occurences. The ministry is a secret service built to protect the 19th century British empire from the paranormal, the occult, and the occasional underground brotherhood bent on overthrowing the government. Headed by the portly Dr. Sound, the ministry has a roster of field agents who travel all over the world in the name of the Queen. Think James Bond, only where Bond drives his Austin Marten and sports his killer Rolex, the agents’ technology is steam-powered. “Phoenix Rising” is the first novel to feature the ministry and its agents. The story opens with Wellington Books, one of the ministry’s key assets, dazed and captured in a remote fortress in Antarctica. In a flash of explosions and gunfire, high-paced chases and witty banter, agent Books is rescued. His savior is the sassy field agent Eliza Braun; TNT enthusiast and big pile of attitude. They return to ministry headquarters, and are both quickly reprimanded by Dr. Sound. Books is returned (tail firmly between his legs) to his role in the ministry as its chief archivist. The archives are housed below the streets of London, powered by the Thames river, and the walls contain the history of thousands of cases conducted by the ministry. For her unconventional tactics during Books rescue, Agent Braun is pulled from the field and buried along with the cases in the archives. Books and Braun don’t exactly hit it off from the start. She is chaos among the order he enjoys, and the archivist life proves to be dreadfully boring to her. It isn’t long before she begins snooping around, and stumbles across the file for one of her previous cases. This unresolved issue isn’t just open on the books. It’s the case that nearly killed her former partner. Books and Braun begin a journey that takes them to mansions, asylums, cemeteries and secret lairs. They must discover the inner workings of a covert society, dodge assassination attempts, solve puzzles, and hardest of all, learn how to trust one another. “Phoenix Rising” is written by Pip Ballantine and Tee Morris, in a very British, lofty style that fits its characters. Books is stuffy, but the reasons behind his mannerisms and beliefs are revealed in a fashion that endears him to the readers. Agent Braun isn’t just a soldier with a death wish, either. She is full of surprises, for both the readers and Agent Books. Morris and Ballantine juxtapose the lead characters very well. They provide fantastic villains, and bias between the characters based on history. The heart of the Ministry story is in the combination of fantastic imagery, innovative technology, and colorful characters. The aptly named Books and Braun are likeable, and the combination of the two creates dozens of laughs. Fighting crime makes strange bedfellows, and following this dynamic duo through their steam-powered rollercoaster of an adventure is worth every second. 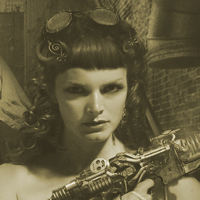 “Phoenix Rising” is the 2011 Airship Award winner for Best Steampunk Literature and a Finalist for Goodreads’ Best Science Fiction of 2011. Read more at MinistryofPeculiarOccurrences.com.